Ceiba Renewables are proud to be a Sunpower Premier Partner. As a Sunpower Premier Partner, you must have a commitment to excellence, provide a superior service and meet performance standards for design, quality and service that reflect Sunpower’s superior products. With our focus on delivering long-term value for our customers, we believe Sunpower are the number one panel of choice due to their cutting edge technology, performance, durability, unparalleled warranty and their environmental credentials. And don’t just take our word for it. There’s a reason why the likes of NASA, Warren Buffett, Apple, Google and many others have made Sunpower their solar panel of choice…. Here we break down the Sunpower Advantage. Since 1985, SunPower® has been leading global solar innovation. SunPower® has grown to become a world leader in the solar industry by inventing new technology, raising standards and breaking records. With more than one million hours of performance analysis, SunPower® leads the industry with the most efficient and reliable solar energy products. As a Sunpower Premier Partner, Ceiba Renewables is proud to be backed by this innovative and trusted company. Not all solar is created equal. SunPower® has spent over a quarter of a century crafting a product that is more efficient than industry standards. For example, it would take 25 conventional panels to create the energy that 18 SunPower® panels can produce. That means less space on your roof and more power for your house. As a result, SunPower® leads the solar panel industry with the world record for energy production. 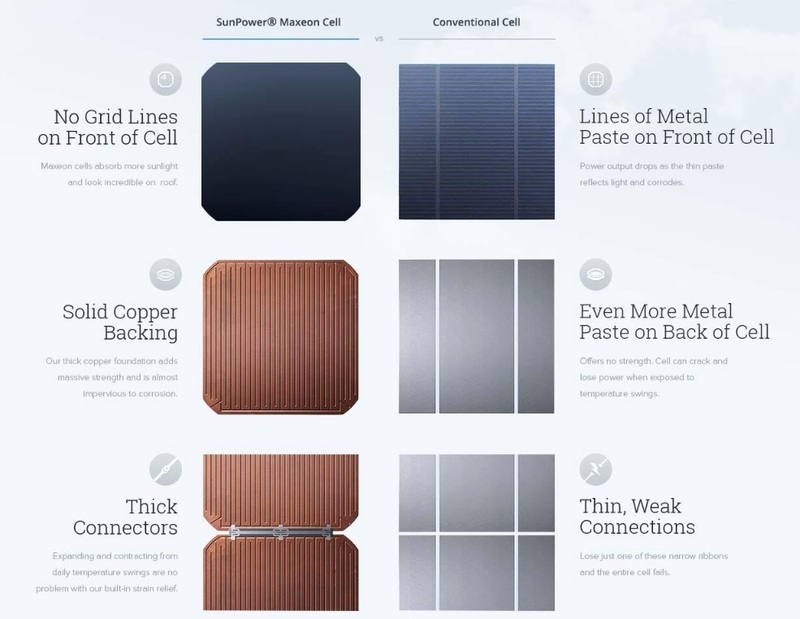 SunPower® has developed new solar panels with their very own Maxeon Technology®. This technology has revolutionised the design and functionality of their solar panels. SunPower® panels capture more light because there are no wires in the front of the panels’ cells. The copper-backed design of the cells then go to work, producing the ultimate output. This technology is combined with highly durable polymer glass to provide a product that is not only more efficient, but also more attractive than other conventional panels. It’s easy to see why conventional panels just don’t stack up against SunPower® technology. SunPower® solar panels surpass the competition by combining intuitive design with the most durable materials available. Made from highly durable polymer glass and copper backing, SunPower® solar panels are able to withstand conditions that conventional panels cannot. SunPower® solar panels are built to to hold up under intense conditions such as tough rain, heavy hailstones, extreme temperatures and even hurricane-grade winds. SunPower® creates products that are designed to last. In fact, SunPower® solar panels have a life expectancy of up to 40 years. On top of that, they are backed with an industry-leading 25-year-warranty, so your solar panels are always protected. Unlike most panel manufacturers, Sunpower don’t only just cover the cost of a defective solar panel, they cover the cost of removing the faulty panel and replacement (i.e. scaffold and labour costs too). We know, it’s pretty impressive. As if that wasn’t enough, SunPower® only works with the most skilled and well-trained dealers and solar panel installers. The Product of the Year award criteria specifically focuses on innovative products that improve energy management, waste management, water efficiency, supply chain efficiency, packaging, air quality, or any other area of energy and environmental management. Administered by the Cradle to Cradle Products Innovation Institute, Cradle to Cradle certification evaluates a product across five similar categories including material health, material reutilisation, renewable energy use, water stewardship, and social fairness. While the IEC standards sets minimum requirements for manufacturers solar panels, in the real world panels take a lot of abuse from wind, hail, snow, heat/frost and even during installation. Often environmental conditions exceed the minimum requirements and so panel failures become more frequent over time, especially if the solar panels have been poorly manufactured. Independent research labs took Sunpower panels and tested them against the top brands on the market. In every test, including: Thermal Cycling (heating/cooling from +85C to -40C in quick succession), Dynamic Loading (wind and snow loads), Damp Heat Stress (for humid environments), Reverse Bias, Light-Induced Degradation (LID), Degradation, Backsheet Delamination, Solder Joint Failure – Sunpower panels outperformed all of their competitors. In the most comprehensive independent degradation study ever done, SunPower’s industry leading low degradation was confirmed by Black & Veatch, one of the most experienced Independent engineers in the solar industry. This study tracked more than 800,000 panels wired to 400 individually-monitored inverters across 144 sites, for time spans averaging six years, including SunPower and non-SunPower modules. SunPower guides to a median degradation rate of 0.25%/ year.